This polarizing presidential election has left many federal workers seriously rethinking their career choices. A Government Business Council/ GovExec.com survey found that 14 percent of federal workers say they would definitely consider leaving their jobs if Donald Trump wins the Nov. 8 presidential election. Another 13 percent said they might consider leaving, while 9 percent said they did not know. 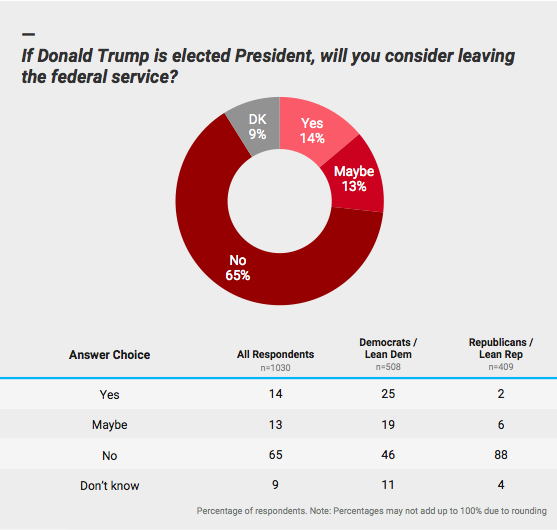 That leaves just 65 percent of federal workers who say they would stay for a Trump administration. The animus toward Hillary Clinton is less severe: Nine percent would definitely consider leaving; 7 percent might leave; 5 percent didn't know. Nearly eight in 10 (79 percent) say they would stay for a Clinton administration. Nearly half of those who say they would leave federal service if their preferred candidate is not elected (49 percent) are eligible for retirement anyway, but the outcome would cause them to retire earlier than planned. About 40 percent would seek a job outside government, while 5 percent would simply quit and then reassess their plans. Perhaps more striking, about 13 percent of federal employees surveyed said they would not have entered federal service in the first place if Clinton and Trump were the candidates to lead the executive branch at the time they applied. 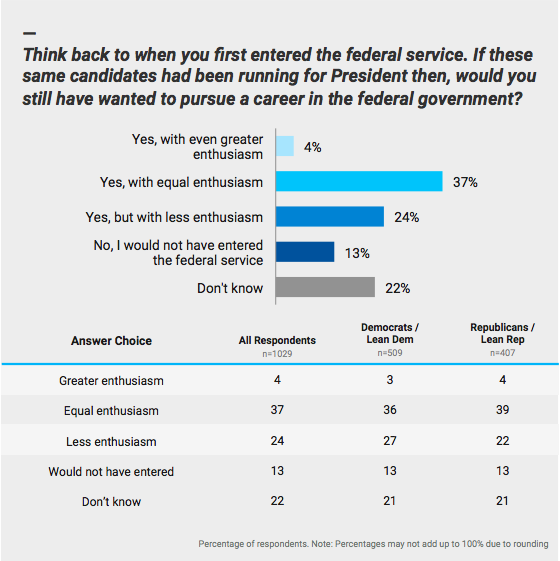 Just 4 percent said having Trump or Clinton as their top boss would make them more enthusiastic about becoming a federal worker. Overall, Clinton leads Trump among federal employees by a 53 percent to 34 percent margin. Government Business Council and GovExec released the survey on Oct. 13 to a random sample of Government Executive, Nextgov, Defense One, and Route Fifty subscribers. At least 1,085 federal employees participated in the survey, including 581 at the GS/GM-13 and above grade levels and 31 members of the Senior Executive Service. Respondents include representatives from at least 35 federal and defense agencies. The margin of error is plus or minus 3 percent.